November 5th was a Sunday and was our day off. Our hosts kindly arranged for a trip to the Taj Mahal near Agra going via Bharatpur. It took us five hours to get to Bharatpur from Delhi, and we had only two hours there, then we drove to Agra and the Taj Mahal. The drive to Bharatpur added a lot of birds to the list: a single Alexandrine Parakeet, three Indian Grey Hornbills, Pied Kingfisher, Woolly-necked Stork, Long-billed Vulture, and a few Bank Mynas as we went through villages, Red-wattled Lapwing, Great Egret, Little Cormorant, Black-winged Stilt and Black Drongo. We stopped for breakfast and I took the opportunity to walk around rather than eat. Fortunately we had stopped near a long pool of water surrounded by reeds and trees. Here I saw Intermediate and Little Egrets, a very dark Eurasian Marsh-harrier, Indian Pond Heron, Red-rumped Swallow, lots of Plain Martins, a single Large Grey Babbler and six Painted Storks (flying). Back on the road the search for birds continued adding Shikra, Asian Pied Starling, Spotted Dove and White-throated Kingfisher. We drove through the town of Bharatpur stopping frequently to ask for directions since the reserve was not at all signposted the route we took. Finally we found the right way and drove (5km from town) past a string of hotels, mostly named after birds, to reach the entrance to Keoladeo National Park, more commonly known to birders simply as Bharatpur. It cost us Rs25 each to get in (exchange rate at the time was Rs (rupees) 66 to the pound!). To take a camera in costs an additional Rs10 with Rs100 for a video camera. To hire local ornithologist/guide costs Rs40 per hour. The local guides are invaluable because they really do know where the birds are to be found. We were allowed to drive some way into the park to an area where the only way to proceed is to walk or hire a bicycle or cycle-rickshaw. Cycle-rickshaw's were duly hired and we headed into the park. I was to find that the rickshaw drivers were good birders (although some bird names were strange e.g. Blue Jay = Indian Roller) and had superb eyesight. The first birds seen were Great Egret, a nice close Rufous Treepie, parties of Jungle Babblers ('seven sisters' to the rickshaw drivers because of the bird's tendency to stay in groups of six to seven birds). We soon stopped to look for an owl but it wasn't to be found. However, a few metres away, in a tree spreading over the road, we found a Collared Scops Owl. This was a great bonus since I hadn't thought we'd get any owls. As we progressed further down the road the surrounding land became wetter and bird numbers increased. Woolly-necked Storks were again seen as were the usual Rose-ringed Parakeets. Various short stops added plenty of Indian Darters, both on tree branches and swimming with their necks only showing. Also seen were a couple of Greater Coucals, lots of Common Moorhens and a group of Black-headed Ibis. The rickshaw drivers suddenly got excited and gestured for us to abandon our conveyances again. 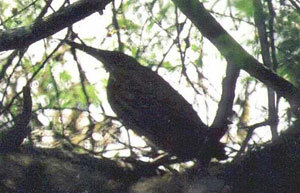 They all pointed to a heron-like bird about two metres away low in a shady spot. 'Black Bittern – very rare' they said excitedly. I crouched down and had great views of this excellent bird. I did try photographing it but it was a bit dark! Birds just kept appearing with Indian Robin in a tree by the side of the road, Purple Herons, Grey Herons and Indian Cormorants in the marshes, a Brown Crake in a dryish spot, Black-winged Stilt, Cattle Egrets, a single White-breasted Waterhen and a Greater Spotted Eagle overhead. A pool of water held about 20 Gadwall and five Spot-billed Ducks plus two Glossy Ibis and Little Cormorants. 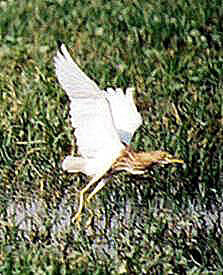 A bird of prey in a tree turned out to be a Crested Serpent Eagle and a Eurasian Spoonbill flew past. 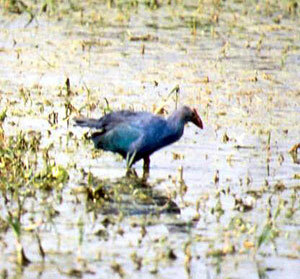 The rickshaw driver mentioned Purple Gallinule (the rather awful name of Swamphen didn't seemed to have reached here yet) and I said to my companion I'd kill for a Purple Gallinule. Seconds later I had my first Purple Swamphen soon followed by many. These birds were probably the most numerous bird seen here. From the other side of the track the driver spotted very nice Bronze-winged Jacana, another lifer, accompanied by a more familar Green Sandpiper. We soon stopped to walk along a side path not suitable for rickshaws. A White-browed Wagtail sat nicely on a fallen tree and Wire-tailed Swallows and Barn Swallows flew around overhead. A couple of Pied Kingfishers used the roadside pool, perching, hovering and diving only a few metres from where we stood. Where to look was the question. The water held more Purple Gallinules, a small flock of Lesser Whistling-ducks, two Eurasian Marsh-harriers flew together, a Laggar Falcon flew low over the grassland and a Tawny Eagle circled high above us. Also here one rickshaw driver spotted two very distant Sarus Cranes and I found a Long-tailed Shrike, White-bellied Drongo and Little Bee-eater. 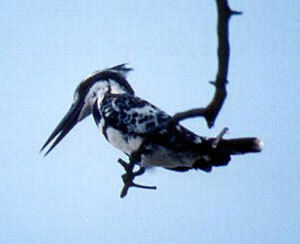 A Common Kingfisher put in a close appearance and another rickshaw driver found a Brown-capped Pygmy Woodpecker. More Painted Storks flew overhead and I found a Common Tailorbird in a tree just over my head. Sadly we had to head back after just under two hours at the reserve. On the way back we did get Yellow and White Wagtails, Indian Roller, Pied Bushchat, two Oriental Magpie Robins, and rare (we were told) Common Coot. As we neared the carpark we added a covey of 6 Grey Francolins and found a Grey-breasted Prinia in a bush.